More than anything, Joel wants to be a Rithmatist. Chosen by the Master in a mysterious inception ceremony, Rithmatists have the power to infuse life into two-dimensional figures known as Chalklings. Rithmatists are humanity’s only defense against the Wild Chalklings — merciless creatures that leave mangled corpses in their wake. Having nearly overrun the territory of Nebrask, the Wild Chalklings now threaten all of the American Isles. 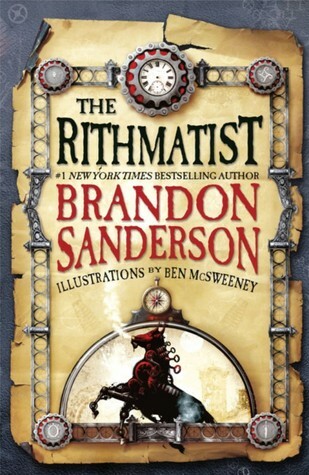 The Rithmatist is a good book that has the potential to be the start of a great series. But it's not quite there yet. It features a fascinating fantasy concept, likable characters, a boarding school, action, danger, and more. However, the book held itself at a slight distance, preventing me from truly forming a connection to it. I loved the idea of Rithmatics. Basically, certain people can draw chalk figures on the ground that come to life. Other chalk drawings are complex geometric circles and lines that function as defensive shields. We are given an introduction to Rithmatic theory in between chapters. You can skip these pages if you'd like - the story still works without them - but it would take away some of the richness of the worldbuilding. As cool as Rithmatists are, I don't totally get it. By the end of the book, my head stopped spinning as I came to a basic understanding of the chalk monsters. I still don't understand why only certain people can become Rithmatists. Or all the mathematical complexity of the figures. Hopefully, future books will explore this further. Joel is in essence a muggle. He is a non-Rithmatist who tries to ingratiate himself into the Rithmatist world. With good reason. He's incredibly knowledgeable about the drawings necessary to create and defend against Chalklings. He knows the theory and is perfect at drawing - basically he can do everything but get his chalk drawings to work. The book has a middle grade feel to it. As such, the relationship between Joel and his co-hort Melody is a friendship rather than a romance. This is quite refreshing as it's rare to have boy-girl friendships. Melody's been told that she's a lousy Rithmatist for so long that she lacks confidence in her drawings and also is easily offended. She's adventurous and daring, but doesn't have the same zest for life as Joel. Somehow the two work well together. The plot was decent. That's a generic term, I know, but it describes my waffling feeling. There's a surprising amount of action and intrigue for a book where the fighting consists of chalk figure drawings. Akin to a riveting chess game or the final round of a spelling bee. Things that shouldn't be exciting yet somehow are. At the same time, it seemed like not a whole lot happened. Plus, you have some character tropes that felt overplayed - there's a Dumbledore-ish type and a Snape. I enjoyed The Rithmatist. By the end of the book, I cared about Joel and wanted to explore Rithmatics further. But I don't necessarily feel invested in the story the way that I hoped to. It's enough to make me want to read on, but doesn't leave me drooling for the next book. This sounds good, Alison! I had never heard of the author, or his books, until BEA, but I didn't think they'd be for me. The plot does sound good and unique! I always appreciate a good boy-girl friendship when I come across one, as it is pretty rare sometimes. I'm glad you enjoyed this book overall, even if you're not totally invested yet. I'm quite curious about it, so I think I'll pick up a copy eventually. Great review! Fantasy and a boarding school are something I love to read. And its nice to read a friendship that doesn't cross the line. Fantastic review and what an interesting concept. The idea is fantastic but sounds like the characters needed a bit more development to truly let you connect with them and with the story. Still, great premise! I never even red the blurb about this one, but it truly sounds fantastic!!! I love the concept and the idea. Even though it's MG I'm definitely trying it out! I've had this author recommended to me, but I'm not sure that I should start with this book. I want to feel a bit more connection to everything. But the concept does sound really good! Hmmm, okay so the idea of the chalk figures is definitely intriguing. But a good idea doesn't hold much weight with me unless it makes sense and is well executed. But this sounds fun anyways. I think I'll start with another one of Brandon Sanderson's books first as my introduction to his writing though. Nicely reviewed, Alison. I know my husband loves Brandon Sanderson's adult books, and I keep telling him to check this out. Of course, since it's YA he refuses, but the more I hear about it the more I want to try it myself. I read this book, thinking it might be okay, but I loved every bit of it. When I found out that the second one wouldn’t be out until 2015, my first thought was that it was a tragedy I couldn’t get to it sooner.